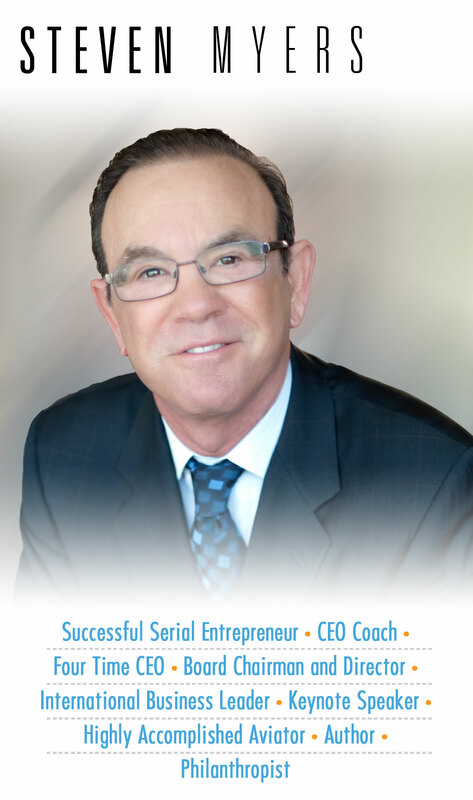 Steve Myers is a highly successful four-time serial entrepreneur, public company board director, public speaker, author, and aviator. He is a nationally recognized thought leader on business competitiveness and a frequent guest lecturer at the University of Southern California’s Marshall School of Business on the topic of Entrepreneurship. He has conducted business in a dozen countries in Europe and Asia. He graduated from Stanford University with a BS in Mathematics, is an Ernst & Young “Entrepreneur of the Year” for Software and Information Services and a recipient of the California Governor’s Special Recognition Award. With a passion for coaching Steve has helped many CEO’s improve how they think about their immediate tactical issues, their businesses strategically, and their lives generally, over the long-run. His coaching approach focuses is on Improving leadership, strategies to achieve critical objectives and adopting best practices for business operations. His goal is to get his clients to recognize and take needed actions that they might not otherwise take, and do so more quickly than they otherwise would. Steve’s private equity investment company, Dolphin Capital Holdings, Inc., invests in companies with innovative business strategies. Portfolio investments include: cyber security, bio-sciences, bio-technology, medical devices, alternative energy, distressed debt and commercial real estate. He serves on several public and private boards and is on the Board of Caladrius Biosciences, Inc (CLBS), a NASDAQ traded innovator in late-stage therapeutics development. Steve founded SM&A, Inc., which grew into a NASDAQ-listed $110 million international management consulting firm (NASDAQ: WINS) that specialized in helping aerospace & defense, aircraft, telecommunications and other high tech industry clients win complex competitive programs. Growing to more than 800 employees, he led spearheaded industry-changing innovations for winning U.S. Government contracts. During his 25-year tenure, the company managed more than $360 Billion in major program competitions. After a very successful IPO in 1998, he served as Chairman and CEO for ten years before the company was sold to private equity in 2008. Steve served on the U.S. Department of State Advisory Committee on International Economic Policy under President Barack Obama, which advised the then U.S. Secretary of Hilary Clinton and then State John Kerry on foreign policy issues. A former Administration policy advisor on cyber security, Steve served on the Department of Homeland Security Advisory Council Task Force on Cyber Resources, led one of key working groups and briefed then Secretary Janet Napolitano on the Task Force recommendations. A two-time US Air Force veteran, Steve is a highly accomplished aviator, with more than 5,800 hours of flight time and eleven jet type ratings. At the end of the Cold War, he was the first Westerner to fly an aircraft into the Kamchatka Peninsula in Far Eastern Russia. There he led the creation of one of the earliest Russian-American joint ventures, converting a remote, but strategically located, military air base into a refueling base for international cargo carriers. His book about his experiences, “Dancing with Russians: Adventure & Entrepreneurship in the Developing World”, will be in publication in 2019.